For starters, we're just like you. Our team is made up of homeowners looking for an easy way to spruce up rooms in our home with the fantastic look of crown molding. 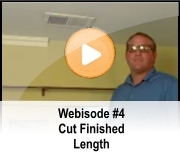 After experiencing several home fixer uppers and remodels, we decided there must be a better way to solve the finishing touch of crown molding for the home. We searched far and wide to find the latest technology available to produce a wood-alternative molding that was easy to install, light weight, would not warp and could be painted to match any wall color or style. Over time, we discovered some pretty clever ways to take high-density polystyrene molding and inject it into specifically formed molds designed after crown molding fashions. We then applied our exclusive Skin-Tec™ technology to create a smooth, hard finished surface providing the sturdiness and durability you look for in wood-based products. Only lighter, more reliable and a lot less expensive!